Today I came across this amazing article in which Benny Johnson collects and displays precinct-level election returns for the U.S. presidential elections of 2008, 2012 and 2016. It very much the sort of thing that I do with historical German elections, although of course my work involves more than two colors. It is really a fascinating piece. Another semester winds to an end. Looking back, how do I think it went? I continue to be thrilled with my online sections of Western Civ, both sprint and semester-length. I require so much more work from online students, its not really fair. The quality of the essays that they have to write on their textbook reading is astounding. Every week I read excellent discussion forum contributions. These vary, of course, as they should but the quality of the work that I read is closer to a 300-level class than a survey. One thing that I noticed this semester was the degree to which they responded to readings on medieval universities and intellectual life. This makes me think that I should record new lectures to burden them with. My traditional class was amazing. I had a very engaged group; they asked a lot of interesting questions and kept me hopping. Because I had a critical mass of interested students, I brought in the books that I was reading in course of semester. They seemed to appreciate it. A note for the future: the class became substantially more enjoyable after the course drop deadline. I inadvertently stopped taking roll. Maybe a third of the class took the hint and stopped attending. My concerns about World Civ continue. The vast majority of students simply do too well. Every semester I adjust the criteria in the hope of producing more variation without success. This is really disconcerting; I will be glad not to be teaching it in the spring. A look towards the future: in the spring, I will be teaching three online and one F2F sections of the second half of Western Civ. I have recast the F2F in the inverted classroom format. The students will read and be tested online, our class meetings will be devoted to discussing sources and reflections on the patterns that they can discern about the time period under study. I am very excited to give this a try. Pax Romana. War, Peace and Conquest in the Roman World by Adrian Goldsworthy arrived from the library just as I was scheduled to lecture on the topic! How very frustrating. I immediately began reading the book in my typical ADD-style (back-to-front, wherever it opened up, etc) but was only able to show my class the cover and cite a few good stories. I have used Goldsworthy’s Augustus extensively, so I knew that this would be good. Well, there is always next year! I found this several weeks ago and have been waiting to post it. When I was in Jerusalem in June, I went multiple times to the Church of the Holy Sepulchre. It is such an inspiring and interesting place on so many levels. One high point was hearing the Franciscans sing the evening Office and accompany them in a candlelight procession within the church reminiscent of the Way of the Cross. Experiencing the church at different times, especially by candlelight, was quite remarkable. It is easy to see why it has been a place of pilgrimage for two millennia. I always made sure to enter the Edicule, the structure surrounding the niche where Jesus’s body was laid. This trip, it was surrounded by construction fencing as a Greek firm was preparing to make important restorations. I look forward to the National Geographic special. Truth-be-told, I was hoping there would be a live streaming of the process as there was of the raising of the Costa Concordia. You can also find additional information here and here. 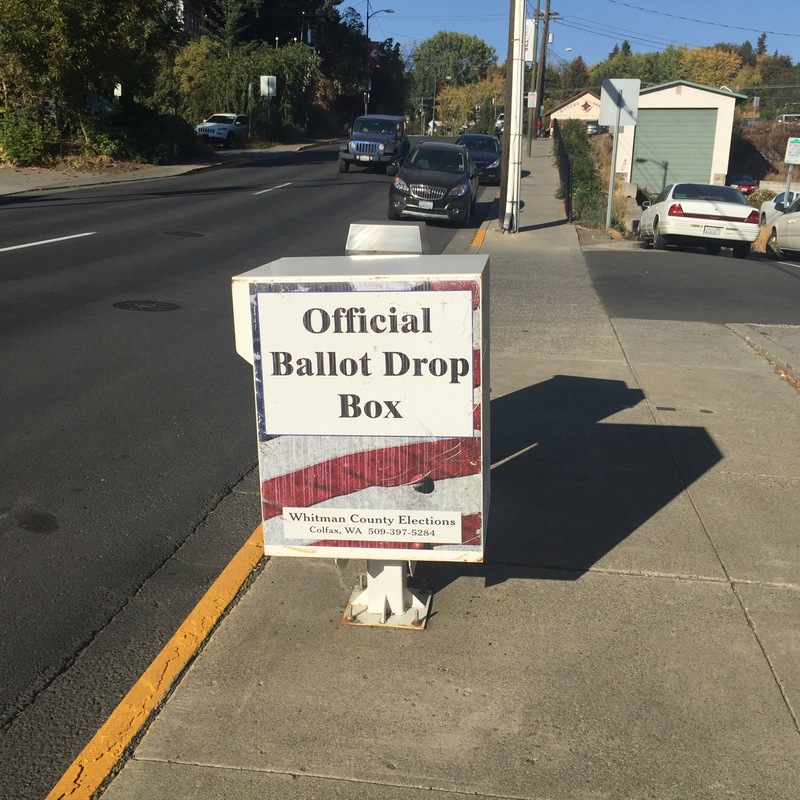 I was out in Washington state last week and taken aback to find these ubiquitous “ballot boxes”. Many more than USPS drop boxes. Color me traditionalist! I have of necessity voted absentee on occasion, but I love the regularity of going to my polling place the first Tuesday following a Monday in November and actually casting a ballot. Morally superior persons will of course explain to me how this is disenfranchising people and I get it. They are morally superior and control the process. I can’t help but think that these drop boxes are several steps too far. Our dear ancestors in this country believed in viva vice voting. You showed up and declared who you were voting for. That’s how it worked in the German state elections that I study. The problem with viva vice is that it was dangerous for subordinate men to challenge the choice of their betters. This was surely the case with the Romans, who conducted bloody elections. But the expectation was, man up.